Animal tales brought vibrantly to life with masks, movement and music. 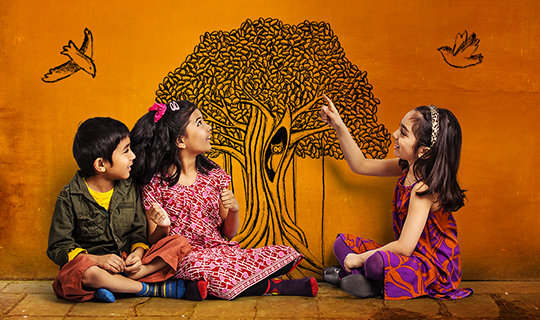 Near the foothills of the Himalayas, three orphans open a magical book under a Banyan tree. Told the book wouldn’t give them answers but they’d learn from it, they stir a pot of milk and three stories of the forest rise from its pages. Stories of headstrong crows, old lions and devious jackals come vibrantly to life, with masks, movement and music. Polka is delighted to be co-producing with Tara Arts this first-ever stage adaptation of The Panchatantra in the UK, directed by Tara Arts' Artistic Director Jatinder Verma with design by Claudia Mayer. For the first time ever, Shamser Sinha brings India’s extraordinary collection of fables, The Panchatantra - India’s most frequently translated literary work - to the stage. A cast of 3 explore the good life through a range of fabulous animal characters.